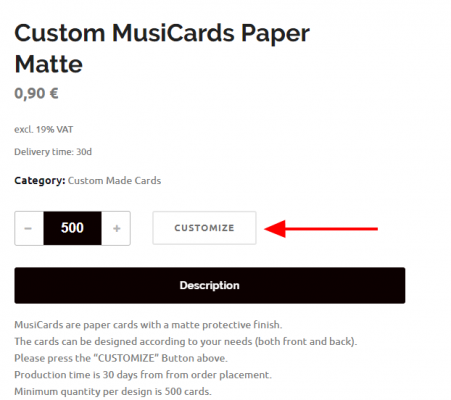 In this article you can find all the information regarding the order process and the design of your MusiCards. The order process involves three main stages: design, linking content and payment. In the main menu choose “order” – You will be redirected to our shop. Choose “customize” to start designing. On the left side of the screen you can find additional tools that will help you while designing. Center snap – will display a grid that can help center your design on the card. Preview – will display both sides of your card on a full screen. Download – allows you to save a version of your design. You can design both the front and the back of your cards. 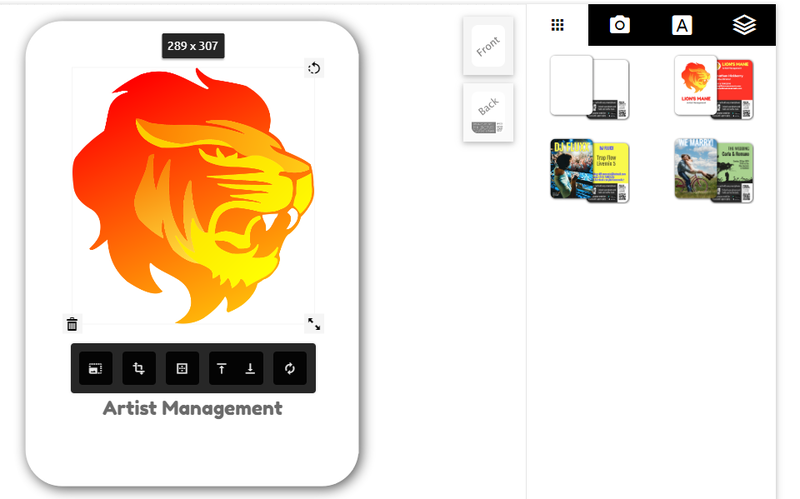 On the right you can choose one of the designs we created (music management/brand, wedding/event, DJ/Artist) – this is a suggestion for a structure, it can give you some inspiration if you don’t know where to start. You can use it as a base and then change the picture, the text and layout. Under you can add a picture and use it as background. You can edit the picture using the advanced editing tools – crop your picture, add filters, control brightness and contrast. You can also rotate your picture, change the size and duplicate it. 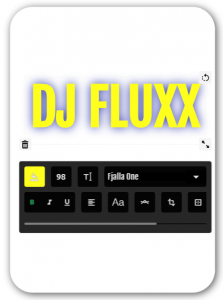 Under you can add your text. You can design the text using regular editing tools – font, size, color, aligning etc. If you scroll down the “customize” page you will see the “landing page” section. The Landing Page is the browser window that opens when tapping the MusiCard to your phone and displays your content. 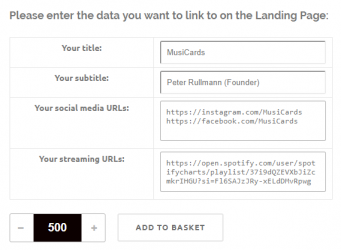 Here you can create your Landing page – choose a title (for example company name), subtitle (your name), add links to your website/social media profiles/playlist on any music streamer. After you created the design and added the content you can place the cards in your shopping cart by clicking “add to basket”. You will be redirected to your cart automatically. Don’t forget to choose the amount of cards you wish to buy – minimum of 500. Press “update cart” to see the final amount to be paid. Now you can create another design by clicking “continue shopping” or place your order by clicking “proceed to check out”. When proceeding to checkout you need to fill in a billing address (where the cards will be delivered to), agree to the terms & conditions, recission and privacy policies and click “place order”. You will receive a confirmation email that your order was placed. We will check our order and get in touch with you. Only after your order was checked you will need to complete the payment.